tile-photos helps you if you need to tile a source image to a given paper (image) size. It's very configurable. It's perfect for creating passport photos, business cards, etc. 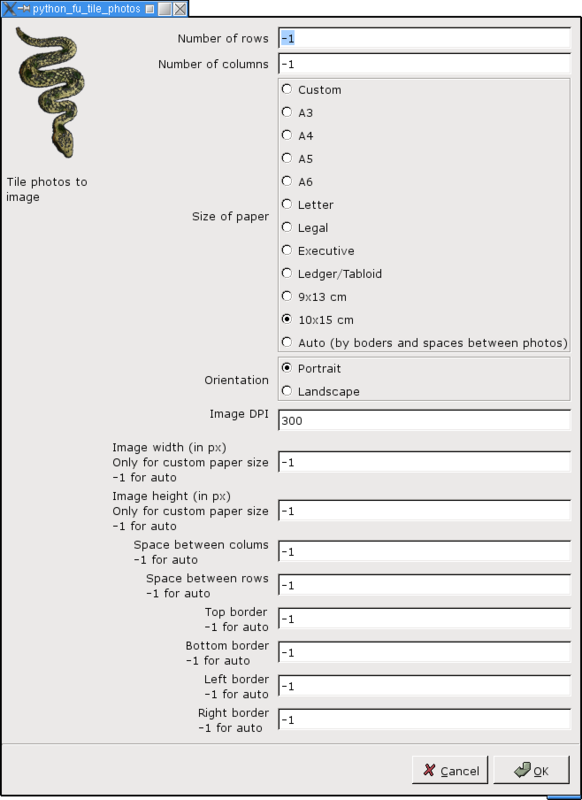 Paper size (the most used are already preset or you can set a custom size). Number for columns and rows of images. Size of (all four) borders. It's not required to set all the parameters. If you use the special value -1 then the real value will be computed. If you set only paper size then the maximal possible number of columns and rows will be computed. And vice versa. If you don't set spaces between images and border sizes there will be set to the same size (both in horizontal an vertical direction). If you set any of this value, only the rest will be adjusted. It's natural — just check it out! Any comments? Share them with the author: Jaromír Malenko [homepage]. I appreciate your response.. This example shows an source image (Lena) and tiled image to the paper of size 10x15 cm. This is the plug-in dialog (don't worry, it's not required to set all the input boxes). Download tile-photos.py plug-in. Changelog is in the source. Save this file to $PREFIX/lib/gimp/2.2/plug-ins/ (where $PREFIX is usually /usr) or to your ~/.gimp-2.0/plug-ins. This applies to Unix system. Under Windows there should be a similar place for plugins. The file must have exucutble permission set. Run chmod a+x tile-photos.py. This plug-in is released under the terms of GNU General Public Licence version 2.